Tai chi has grown in popularity to the point that it’s giving yoga a run for its money. Now practiced by about 3.5 million Americans, Tai Chi boasts a mountain of scientific literature supporting its health benefits for people of all ages and abilities—from healthy young adults to the elderly or wheelchair bound. Investigations suggest a regular Tai Chi practice can bring welcome relief from a variety of medical conditions. Tai Chi is a mind-body practice with a somewhat fuzzy history dating back about 700 years in China. 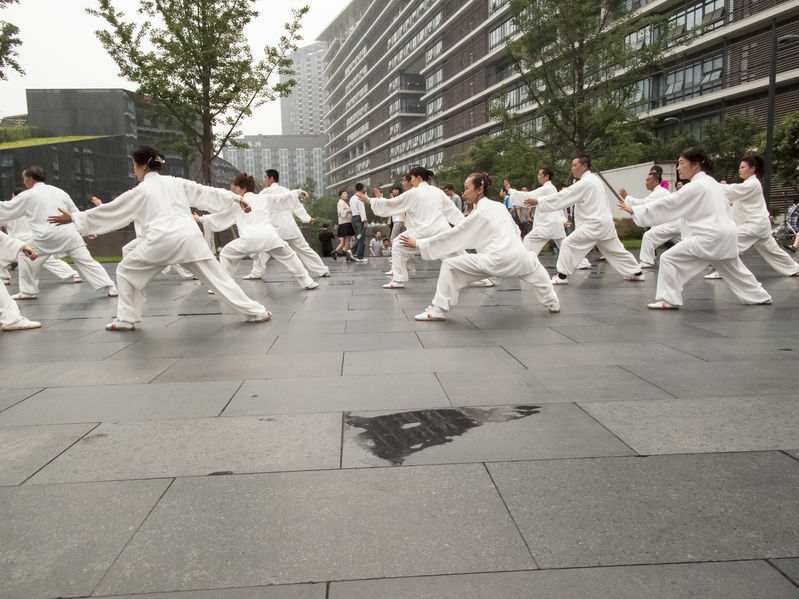 Foundational concepts are believed to stem from the Tao Te Ching, I Ching and others.Tai Chi remains popular in China, where it’s practiced daily en masse, often early in the morning in parks and open spaces. Slow, gentle movements are integrated with breath work and a variety of cognitive components, including mindfulness and visual imagery. The fact that Tai Chi requires very methodical, low impact movements makes it especially suitable for older adults and those recovering from illness or injury. In September 2015, a meta-analysis published in the British Journal of Sports Medicineexamined the effects of Tai Chi on four chronic health conditions: cancer, osteoarthritis, heart failure and chronic obstructive pulmonary disease (COPD). Based on review of 33 studies, researchers concluded Tai Chi provided at least some benefit for all of these conditions, including strength, balance and posture—and did so without side effects. Most of the studies involved one-hour Tai Chi sessions done two or three times per week, over the course of 12 weeks. Tai Chi positively impacted upper limb functional mobility in patients with breast cancer, and reduced symptoms among fibromyalgia sufferers, improving their quality of life. Several studiessuggest Tai Chi can improve sleep quality as well. It turns out that this mind-body practice is also excellent for your bones. Tai Chi appears to increase bone mineral density and reduce bone loss/resorbtion in postmenopausal women andbreast cancer survivors. In a Tufts University study, one hour of Tai Chi twice a week for 12 weeks reduced pain and improved mood and physical functioning more than standard stretching exercises among people with severe knee osteoarthritis. In a Korean study, Tai Chi significantly improved flexibility and slowed the disease process for ankylosing spondylitis, a painful and debilitating form of spinal arthritis. A group of 21 obese women saw improvements in their resting systolic blood pressure, chair rise test, mood, and percent body fat when implementing a two-hour weekly session of Tai Chi; positive effects were also observed in those with type 2 diabetes, with respect to blood sugar levels and insulin receptor sensitivity. Tai Chi appears to exert some positive immunomodulatory actions, such as strengthened resistance to hepatitis B and varicella zoster viruses. A meta-analysis published in PLOS One investigating the effects of Tai Chi (along with other mind-body therapies) on the immune system found these practices seem to stimulate antiinflammatory effects, as evidenced by reduced C-reactive protein levels. One study found Tai Chi had “antioxidant” effects in the body after 12 months of practice. Positive psychological impacts may be the most powerful gift Tai Chi has to offer. The broadest review to date is a meta-analysis, published in BioMed Central, that found Tai Chi produced broadly beneficial psychological effects ranging from increased self-esteem to reductions in stress, anxiety, depression and other mood disturbances. Results of a 2008 study suggest Tai Chi’s psychological benefits can even extend to traumatized refugees and torture survivors, as well as seniors with major depression. Positive psychological effects have also been documented in those suffering from traumatic brain injuries (TBI). A pilot study found Tai Chi to be effective at mitigating the deterioration in interpersonal functioning among patients with schizophrenia. 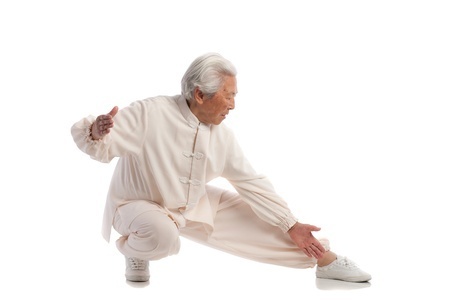 Tai Chi offers a number of powerful health benefits for the elderly. Seniors are the fastest growing segment of our population. The percentage of Americans age 65 and over increased from 4.1 percent in 1900 to 13.0 percent in 2010, and is projected to reach 20.9 percent by 2050. It’s no surprise seniors’ healthcare needs are increasing along with their numbers. It’s widely known that the elderly have a higher risk for falls and fractures. A 2012 study found Thai Chi more effective than traditional physiotherapy at preventing falls due to its improvements in balance, posture, muscle strength, range of motion, proprioception and coordination. Three studies support the effectiveness of Thai Chi in reducing bone fractures among older adults, including a 2011 meta-analysis. Other studies show similar benefits for patients suffering from Parkinson’s disease, chronic stroke, and multiple sclerosis (MS). Tai Chi has been described as a “moving meditation”—but with the abundance of literature highlighting its head-to-toe benefits, some are now calling it “moving medication.” You can learn Tai Chi at home from books or the Internet, but joining a class with an experienced instructor will ensure you’re doing the movements correctly and safely. Morgan N, Irwin MR, Chung M, and Wang C. The Effects of Mind-Body Therapies on the Immune System: Meta-Analysis PLoS One. 2014; 9(7): e100903. Azimzadeh E, Hosseini MA, Nourozi K, and Davidson PM. Effect of Tai Chi Chuan on balance in women with multiple sclerosis. Complement Ther Clin Pract. 2015 Feb;21(1):57-60. doi: 10.1016/j.ctcp.2014.09.002. Valerie Burke, MSN is a Clinical EFT practitioner and freelance health writer in Olympia, Washington, with backgrounds in both allopathic and integrative medicine and a Master’s Degree in Nursing Science. Her areas of interest include nutrition and energy psychology, and integrating principles of holistic health to create balance in mind, body a spirit. Valerie is the author of “Is the Paleo Diet Right for You?“ You can learn more about her atwww.valerieburke.net. Internal Site Commenting is limited to users that have a Friend or Professional Membership. Seeking to roll back the clock? Tai Chi, an ancient Chinese martial art, may be the answer. A new study published in Cell Transplantation found that Tai Chi can help raise the numbers of a stem cell — CD34 cells — important to a number of the body’s functions and structures. To evaluate the potential life-lengthening effect of Tai Chi, researchers conducted a year-long study comparing the rejuvenating and anti-aging effects among three groups of volunteers under age 25 who engaged in either Tai Chi, brisk walking or no exercise at all. “We used young volunteers because they have better cell-renewing abilities than the old population and we also wanted to avoid having chronic diseases and medications as interfering factors,” said study author Dr. Shinn-Zong Lin of the China Medical University Hospital, Taiwan, in a release. According to the study’s authors, Tai Chi “has been confirmed to benefit” patients with mild to moderate Parkinson’s disease and fibromyalgia. In addition, Tai Chi also appears to help with balance, blood pressure and stress reduction. The new study found that those who practiced Tai Chi enjoyed a significantly higher number of CD34 cells than those in the other groups. Yet over the years, many studies have linked Tai Chi with various health benefits. For example, one study from 2012 found that Tai Chi can give your memory a boost.Indeed scientists found that elderly Chinese people who practiced Tai Chi just three times a week for eight months performed better on memory tests than those who didn’t do Tai Chi. Still another study from 2012 — this one involving people with Parkinson’s — found that Tai Chi improved balance and lowered the risk of falls. Tai Chi, which originated over 2,000 years ago in China, emphasizes breathing and involves a series of movements performed in a slow, focused manner.